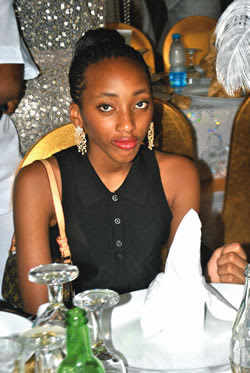 Shade Okoya's first child, Olamide, was recently spotted at a function looking so much like her mum. She is 13 years old now. Shade has three other children. Linda na news be dis. Wetin corcern us with okoya daughter.cos dem get money?. Pikin na pikin to me. I no value dem pass those wey dey under brigde. Who is shade okoye pls? bia,aunty linda aka ogba asiri,who is shade okoya again???? Dere is absolutely no resemblance between d both of them. How is this news biko??? She's beautiful but she look twenty five though... "Just saying"
Linda u b beanz! Is it soo hard 2 tag ya pics?! N u beta post my comment! She dosent look 13 at all!! Aleardy wearing makeup at age 13??? Na wa o.
Wetin concern us,who be she self? They look so alike! But! I don't like it when kids are dressed as adults, doesn't send a good signal. Wetin concern us,concern shade okoya pikin? Abeg give us real gist abeg. How z dis NEWS linda abeg? Zit coz she z an "OKOYA"
She will be more beautiful than the mother lol..
Chip of d old blog. Nice. So wat makes a 13yrs old all grown up eh? One old man like her papa go come marry am sharp sharp. linda biko .hu is shade? So? cos she's a member of the Okoya family? This is no news.There were thousands if not millions of Nigerians born in the year 2000. You also need to absorb Adaobi Nwaubani's article. She's mummy's copy. All grown up! Children of nowadays are looking quite older than their age. She don start puberty be that. This is time for mummy to have that mother-daughter talk. Money yab man abeg! See as 13yrs pickin don fine finish! Chei!...egwu don mature for the business !!!! give her good motherly training. I will marry her when i am 50 years old. wow is this the little one we used to check out in ovation back in the days when we were obsessed with society weddings and the okoyas particularly? she is so grown. Ummm okay. So how is this news again? For a 13yrs old, she is grown too fast. Aunty Linda, plzzzzzz how is dis news????? Mtcheeew!! D young shall grow... Rem her 1st bdy pic I saw in ovation bk then. Time flies sha. How is diz a news?? She's nt as fine as her mum jo. She even looks older than 13.
oooh! wonderful! im jumping for joy because olamide is now 13 and she looks like her mum...please give us something better. Linda,hope they havnt kidnapped you,this one that uve bin MIA since morning. SADE OKOYA TRY SHA. STILL THIS SLIM AFTER THREE KIDS. She's not as pretty as her mum... I think she looks more like her dad. She doesn't look a bit like her mom. LWKMD! Well still growing,use dat as a consolation. She is a split image of her beautiful mum! So what is d news in dis? This Linda can be dry atimes! I hope Sir Bonario will nt see a fresh vision as he did in regards to pst Paul's Daughter. She's jst 13 pls. No. Aba type full market. The days Eleganza plastic was selling, the days Dele Momodu's Ovation din't have rival, when what happened to the Okoyas was big deal. Wellcome to the world of veriety. We have so forgotten all those. HA! Google is your freind! No sweety dats d real deal.trust me okoya is wat we call good old quiet money.just because he dosent make so much noise dosent mean he isn't reach..o bdw av u heard of eleganza,dats her daddy! Shade do runs and jazz so tey she marry Okoya...well done o. She is such a pretty girl but that picture doesn't do olamide justice.